Thanks Jay. Thanks a lot. The advertising mentions that the ride is at the "Disneyland Resort"... what's wrong with that? Every ride or attraction that's opened since 2001 - Finding Nemo, Tower of Terror, etc. - has been advertised like this. From the billboard, who can even tell its a ride? Looks like another franchise parade or show. It's only a logo, nothing more. Don't make things worse, Merlin Jones. It's bad enough that you, Spokker, et al are annoying and anti-Disney enough as it is! With "Resort" in "I need my Mighty Microscope to see it" font. I have seen the commercial - and is it Main Street or the new look of the Pier with all of the lights and victorian era structure. One could say that this is correct. However, the naming thing (mania vs midway mania) as well as the resort slight of hand has been a constant since Jay took over. Please Bob Iger, save us from this one eyed monster! The commercial mentions that this ride is coming to the "Disneyland Resort", not DCA. To make matters worse, it says you can "see the new ride with a Park Hopper ticket"!! Um...no. You do not need a more expensive park hopper ticket to see this. You can buy a one day ticket to DCA and see it just fine. Why can't they just advertise how it is? Is there any honestly left in the marketing industry? I hate how dishonest marketing ploys like this are still allowed to make their way into an otherwise great time for DCA. They don't market to you or I, they market to the people I work with. They know some about DL, but very little about DCA. They know where DL is, but no idea where DCA is. You market to the masses in the So Cal area and get them to the resort. Once there Disney now has a captive audience and can steer people to the right resort, or both if possible. People know and love Toy Story, so you highlite that. Wouldn't DCA's attendance do better if people actually knew this was at DCA? I could see if DL was having attendance problems, why this would be a benefit, but how does getting folks to come to DL when where they really want to be is DCA help out DCA's flagging attendance or DL's overcrowding? And the whole name thing is rediculously confusing? I haven't seen any articles that have been correct including this one Honor. Toy Story Midway Mania is the name on the sign at DCA. I don't believe it says that at DHS, where it should just be Toy Story Mania. What I don't understand is, why has Disney been so draconian about nomenclature before (it's Tom Sawyer Island, not Tom Sawyer's Island, Storybook Land, not Storybookland) consistent to a fault when nobody would notice those differences, but with this attraction every other article is inaccurate. Very confusing. QUOTE - "The advertising mentions that the ride is at the "Disneyland Resort"... what's wrong with that?" FYI, the Florida version sign does state "Toy Story Midway Mania", with the word Midway spelled out in Scrabble Tiles. Also, the DHS Guide to the Magic Map lists the attraction as "Toy Story Midway Mania!". And here is a link to a few selected images of the Disneyland Resort TV Commercial for Toy Story Mania! 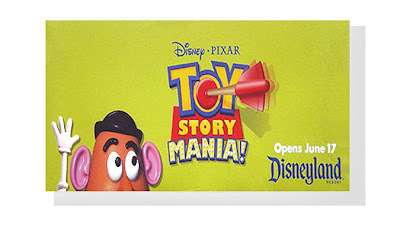 The official naming at BOTH PARKS/RESORTS is "Toy Story Mania!" when it is used OUTSIDE of Resort property (DL and WDW). When you are INSIDE the Resort(s), it is "Toy Story Midway Mania!" Period. Get used to it. This, I would gather, is because most people either don't know what a Midway is or it sounds rather odd if you don't 'see' the ride or know the premise. Well on the one hand, that's nice that they have the same names at both parks, much less confusing. On the other, why it would be called one thing inside and one thing outside is beyond stupid. Course, this is right in line with playing to the lowest common denominator. People don't know what a midway is? Well for goodness sake let's not tell em! We'll just omit the word!" Why retheme the whole pier to an era and location that nobody's familiar with then? If we stopped using all the words that the average person is unfamiliar with, we'd be left with a handful of swear words and vague simple sentences. It reminds me how often I see parents with young children, and the kids really behind with learning to talk. Watching the parents, the kid says "Choo Choo" and rather than say, "Yes darling look at the train going by" the parent just says "Choo Choo" each time the kid says it. Great way to teach new words. Though I usually find it hard to share your optimism over the direction Disney is heading, I'm glad we both agree that Jay Rasulo is an idiot. If Pressler wasn't so terrible with budget cuts and lack of maintenance, I would have preferred him to Jay. At least the parks kept their identity under Pressler. If you’ve noticed those freeway billboards or television commercials promoting the new Toy Story Mania interactive dark ride coming to “Disneyland” (in giant letters), then you probably missed the “Resort” (in microscopic letters). Another example of senior management not getting how the brand derived its value in the first place -- quality, attention to detail, and honesty with its guests. There are already plenty of clueless tourists as it is that buy tickets to Disneyland and end up in line to enter DCA (even though there are huge California letters outside of the entrance).. These ad campaigns further the confusion because most average guests dont understand that the term "Disneyland Resort" encompasses both parks downtown Disney and the hotels.. they think its just DL park. At WDW all attraction-specific billboards list the park it is in at the bottom, not "Walt Disney World Resort"...They dont want to get ppl confused and end up at Universal looking for the attraction advertised, especially since they have a lot of billboards near the Universal Resort Area. Why not just say "Disneys California Adventure Park at the Disneyland Resort"? I guess they expect people to buy the parkhopper anyway, so it's a moot point. I personally don't agree with buying a parkhopper, and I always recommend that people go to Disneyland for one day and skip DCA entirely, and wait for the 2fer promotion, or until 2012. Boy do I pity the hourly wage cast members who have to deal with the irate guests on this one. You'd think after almost 53 years management would realize exactly how sheep-ish most Disneyland visitors can be. And hiding the truth of DCA does not make it go away, so unless you're about to do away with the whole one-park/park-hopper ticket distinction (which many recent promotions for SoCal residents seem to be doing), I'd steer clear of this kind of misrepresentation, especially since they're now using the traditional "Disneyland" font as the resort logo, rather than that horrid (but distinct) "corporate" logo to signify both parks.